While we were on vacation my best friend April had the nerve to have her baby. I don't understand why she couldn't just cross her legs. But she couldn't wait. Since I had a cold on vacation, I waited another week to see her. 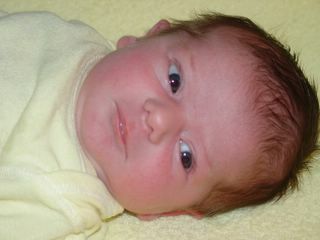 This is Abigail at 2 weeks old. Isn't she just adorable. did you eat it? Was it good? Sami got all dolled up to go to the boardwalk.